The Light Fandango was XyloVan’s mutation for Burning Man, 2014, and it will return to the playa in 2018. Form followed function with Light Fandango. JANUS, XyloVan’s mutation for 2011, proved to be horribly difficult to set up. I had plenty of great help in designing and fabricating everything for JANUS in the spring and summer of ’11 (thanks again to the extremely talented David Hoffman and Marcelle Gravel and to my loving, long-suffering wife and children for all their wonderful work and patience). 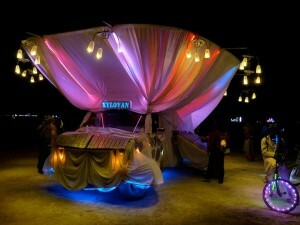 But when JANUS reached the playa that year, the setup work was mostly solo, and took me so long to execute – 2-1/2 days! – that by the time I went for my Department of Mutant Vehicles permits, I was so dehydrated, exhausted and cracked-out that it took a good couple hours of driving around on open playa (growling and muttering curses at happy hippies) for me to calm down and share the beauty of operating a mutant vehicle with the people who came to enjoy it. I resolved instead to build something in 2014 that took much less time and effort to set up, and was rewarded (thanks again to my 2014 on-playa build crew – Sam Hiatt, Jeremiah Peisert, Lindsay VanVoorhis, Dave Ayers, Anna Metcalf and the unstoppable electronics expertise of Spencer Hochberg) – with a 10.5-hour setup and a delicious week of playa interactions.